Planning to buy a home this spring? Then right now—yes, during these last days of winter—is the time to get rolling. “Spring is peak home-buying season, which means you’re going to have a ton of competition from other buyers,” says Peggy Yee, supervising broker at Frankly Realtors in Vienna, VA. Hence, winter is the ideal time to get ahead of the curve, but how? Follow these steps and you’ll be way ahead of the pack once the spring home-buying season heats up. Teaming up with a buyer’s agent during the winter offers several advantages. For starters, because business is slow, an agent can take the time to help you identify what type of home you want and educate you on the local market so that you’ll have realistic expectations of what you’ll be able to find in a few months. 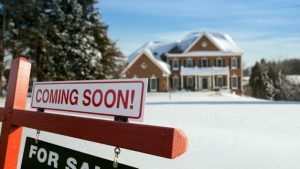 Also, “your agent may hear of properties that are going to come on the market in the spring, which could enable you to get a sneak peek at homes before other buyers,” Yee says. To find a real estate agent, you can ask friends or family for referrals, or use a reputable real estate agent database. “If you’re laser-focused on a specific neighborhood, you’ll want to work with a neighborhood specialist—someone who knows the community like the back of their hand,” Yee advises. Before you even lay eyes on a house, you should be looking at lenders. Why? Because lenders will help you get real about how much house you can afford. They will determine how much money they’re willing to lend you by checking out your financial details, from your income to your credit score and more. Plus, if your finances are less than perfect, you’ll be able to find out in plenty of time to make amends. There’s no magic spell to banish poor credit; the strategy will depend on your financial situation. “For some people, it might make sense to pay off their credit card balances over the next couple of months, but that might not be the right move if you’re going to need the money for closing costs,” Redmond explains. Thus, it’s beneficial to get credit advice from a mortgage professional at least two to three months before you plan to buy. If your credit score is strong (760 and above will qualify you for the best interest rates), getting pre-approved for a home loan now makes sense. You’ll probably do an initial consultation with your agent to identify what type of home you want to buy. However, you won’t really know what type of home you’re looking for until you actually step inside some homes, says Lisa Cahill, co-owner of Evolve Real Estate in St. Petersburg, FL. “Your criteria can change when you start to look at properties,” says Cahill. For example, you might think you need a home with 2,500 square feet of living space, but that number could change when you start seeing homes in person. Your real estate agent can alert you to open houses to attend during the winter months. Have your sights set on a particular neighborhood? Winter is a good time to see whether the community is going to be a good fit. “You can tell whether an area has good schools on paper, but there are a lot of things you can’t judge unless you go there in person,” says Cahill. For instance, online research won’t show you what the noise level is during rush hour or what the neighbors are like (e.g., is it more for young families or older residents?). Those are things that you need to assess with your own eyes. Concerned about traffic? “Go and test-drive your commute,” says Yee. Even if you had originally planned to buy later in the spring, what if you find a home you absolutely love earlier? If you’re willing and able to move earlier, then keep an open mind with respect to buying a home during the winter. Granted, there are fewer homes to choose from, but there’s also less competition. “You’re less likely to encounter a multiple offer situation,” says Yee. Translation: Don’t hesitate to make an offer in February or March if you find the perfect house. Planning to sell the home you’re currently in this spring as well? Tune in tomorrow for the early bird’s guide to selling your home.